This is a recipe I like to make at least once every fall or winter. Most of the ingredients can be easily held on hand and it is a delicious, satisfying way to get a day’s worth of colorful veggies. While this recipe works well as a unique side dish, perfectly paired with poultry or pork, it makes a hearty vegetarian main dish as well. 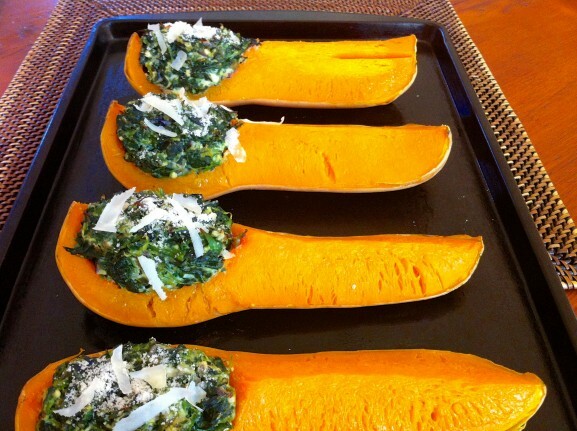 The squash may be pre-cooked and the spinach mixture prepared in advance. Simply assemble and bake when ready to eat. You can eat the two components separately, or mash them all together as I do! If you have any vegetarians joining you for Thanksgiving, this recipe would be a terrific option. To make things easier the day of, prepare entirely in advance and gently reheat. This recipe was shared with Chocolate, Chocolate and More Chocolate and Thursday’s Treasures. Cut squash in half lengthwise. Place cut sides down in a baking dish filled with about an inch of water. Bake 25-30 minutes or until barely tender. Remove from oven and pour off any remaining water. While squash is baking, mix the remaining ingredients in a medium bowl. I think it is easiest to combine everything but the spinach and then work that in last. Allow squash to cool for a few minutes. Then cut in half lengthwise again. Stuff the recessed area with the spinach mixture and bake for an additional 15 minutes or until the squash is tender and the topping is just starting to brown. Remove from oven and sprinkle with additional Parmesan, if desired. I think the easiest way to remove water from the thawed spinach is to wrap it in a clean tea towel and literally wring it out. You will be amazed out how much liquid you can quickly and easily remove this way. Mmmmmmm I need to get more butternut squash. That’s all there is to it! Love the idea of stuffing a butternut squash. Makes me think of a butternut squash ravioli but healthier. Thanks for sharing on Thursday Treasures. Wow what a great idea. I love butternut squash, and the spinach and ricotta stuffing is the icing on the cake for this. Or in this case the stuffing on the butternut. I might try this later, I will let you know how it goes. Love the blog by the way! Thank you, Joshua! I love your description and I hope you get a chance to try this. Do let me know! this looks wonderful. I posted to my facebook page. I love any blog that has a category “mason jar ideas”! Hello there, You have done an incredible job and I will suggest your site to my friends. Thank you!